From the moment I first held onto a mala I was hooked. The energy, the meaning, and the feeling it gave me, especially when I used it for meditation, was amazing. To have something like this to hold during my meditation practice was truly transformational. Here are five reasons why I think a mala will help rock your practice, too! 1. It's all about the mantra. Mala (translated as "garland") is traditionally 108 knotted beads of natural material such as rudraksha seed, bodhi seed, sandalwood or gemstones. It's intended to assist in counting a mantra during a meditation practice. If you're inspired by Sanskrit mantras, this would be the spiritual tool for you. Sanskrit mantras have been passed down for generations, and were carefully crafted to be a gateway to our higher selves. Even if you don't understand the mantra, reciting it still has amazing benefits. And even if mantras don't resonate with you, you can try using a mala to count affirmations of your own creation, too. 2. It's something to hold on to. 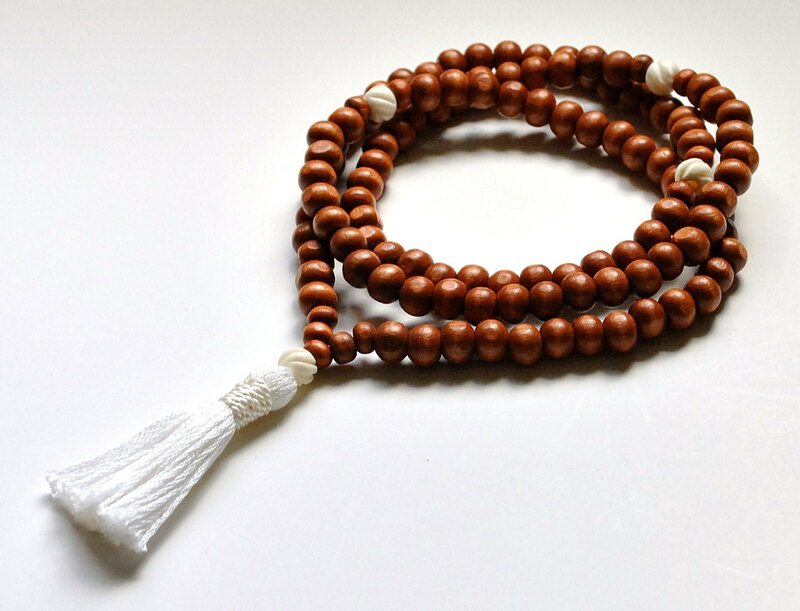 The best thing about a mala is that it's tied to the physical plane and can really be a wonderful tool for someone just starting a meditation practice. Telling a beginner to simply "focus on the breath" can lead to feelings of frustration. The constant thoughts coming and going can be discouraging. While even the gentle witnessing and refocusing of thoughts is a kind of meditation, those who are just starting out may find it challenging. Holding a mala can keep beginners firmly grounded and centered. The physical act of holding it and coming back to the mantra can keep the focus for longer, sometimes with even greater ease. 3. It gives you good vibrations, baby! It may be just me, but I'm enamored with gemstones of any kind! They speak to me, so having a mala of a certain material makes it all the more powerful. Each gemstone or seed has a vibration that can really enhance your spiritual journey when you find the right one. My advice for anyone searching for a mala is go with your gut. The right gems will find you when you need them. Don't overthink it. Go what you are initially attracted to, even if it is just the color of the stone or the feel of the material. 4. It helps set up perfect timing. For some, setting a specific amount of time to meditate can be useful. There are plenty of apps and timers to help you set a certain number of minutes or hours. If you meditate with a mala with a mantra enough, you'll begin to notice it will take you relatively the same amount of time to recite a full mala. So if you are looking to have a 15-minute practice, you may come to know that doing a mala with the Durga mantra will take you about that length of time. 5. It's an everyday reminder of your practice. Some people love to wear their malas. There are many different schools of thoughts on this, but for those who do enjoy wearing their mala every day, it can be the best reminder of your spiritual goals. If you are wearing your mala every day in your workspace, at home, out with friends, or with your children, just think of the power you're toting around with you! This simple garland of beads can act as a home base for you when you reach a point of overwhelm at any point during your day or when you find yourself becoming distant from your intentions. On top of all this goodness, with the regular use your mala becomes infused with your unique energy. For every recitation, for every moment held, for every experienced witnessed on your path, the mala becomes programmed with your vibration and the story of your journey. Enjoy it as it resonates with your daily life! What Type of Yoga is Best For Weight Loss?